This release is destined to be a legend! The eighty-eight is probably the most well known artillery piece of WWII. After painstaking research, this ALL-NEW kit greatly surpasses the detail of kits on the market today and is loaded with extra features. The German eighty-eight is probably the best known, even famous, artillery piece of World War II. It was not one gun, but a series of anti-aircraft guns officially called the 8.8 cm Flak 18, 36 or 37. Flak is a German short form of Fliegerabwehrkanone, meaning anti-aircraft gun, the original purpose of the eighty-eight. The Flak 36, which included a two-piece barrel for easier replacement of worn liners, and included a new (and heavier) trailer that allowed it to be set up much more quickly, simply dropping the base while still mounted on the wheels. This made it much more useful to the troops during fast moving operations, the basic concept of the blitzkrieg. The eighty-eight was used in two roles, one as a mobile heavy anti-aircraft battery, and also in a more static role for the defence of Germany. In this later role the guns were arranged into large batteries, directed by a single controller, and were moved only rarely. 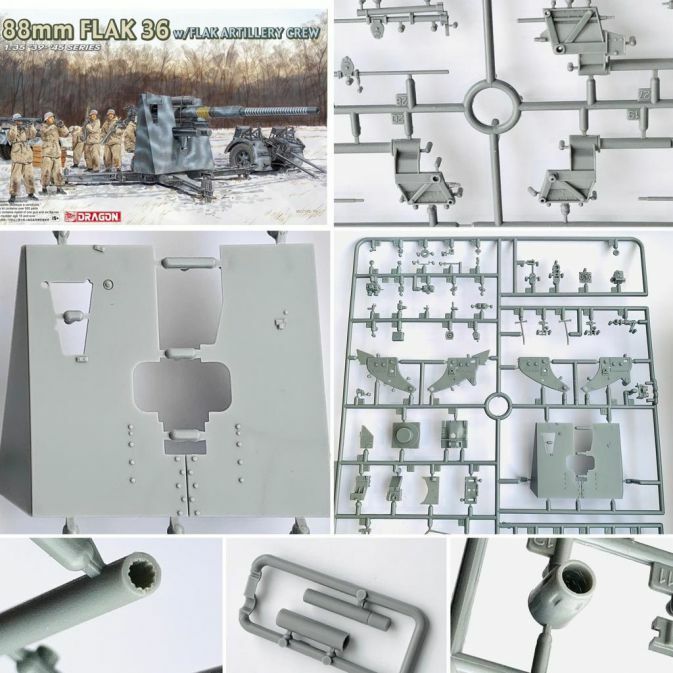 Changes for the Flak 36 improved mobility at the price of weight.